A post by Professor Donna Pankhurst – Professor of Peacebuilding & Development, University of Bradford. With eighteen postgraduate students hailing from seventeen countries, our group made quite an impression on some of our hosts. 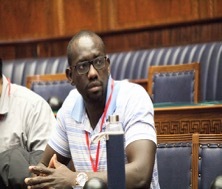 All had an interest in, if not actual experience of, what happens to societies after the official ending of a conflict. 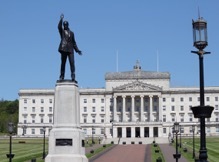 Ably organised and led by our Student Liaison Officer, Sanna Tukiainen, we spent several days in Belfast and Derry/Londonderry, in atypically warm and sunny weather, with an ambition to learn lessons from Northern Ireland. We had a varied itinerary, including community and official organisations, the University of Ulster, and a dinner talk from the inspiring long-standing peace activist Ann Patterson. 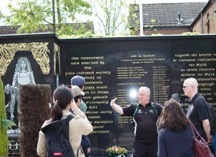 We took three walking tours led by an academic/community activist, and two former IRA prisoners. Our guides were well-known characters, greeted by many as they presented their narratives in the urban landscape. Such ‘peace tourism’ tours feature in other post-conflict countries and are not without their challenges – how do we contextualise the selective narratives presented to us (especially with the added complication of very strong accents that some find hard to understand)? Other practices of memorialisation seemed to reinforce what one member called a ‘cult of armed violence’. 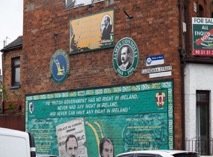 We saw plenty of recently-painted wall murals which glorified armed men and weapons, from both communities, which would not be tolerated in many parts of the world (and in spite of Belfast City Council removing 40). Similarly, the maintenance of ‘peace-walls’, which divide the areas of residence in parts of Belfast, shocked the group. All our hosts highlighted the importance of European funding for positive change, which has been guaranteed by the UK government until the end of 2022. In poor countries emerging from conflict funding is not always so forthcoming. Some expressed concern that much of the funding has gone to people who committed violence rather than victims, but debate on this issue has been much more limited than in other countries. Our hosts were uniformly exasperated and bewildered by the implications of Brexit – several of them live in Ireland / ‘the Republic’ / ‘the South’ and commute to work in ‘the North’ / ‘Northern Ireland’, and cannot see how a post-Brexit border will work. 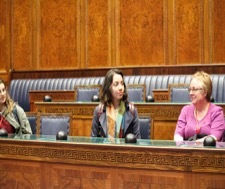 At our visit to the seat of the NI Assembly, Stormont (on an almost surreal sunny Spring day), we were lucky enough to meet a member of the Alliance Party who generously took the time to tell her own story but also very engagingly described how she had managed to bring politicians from Sinn Fein and DUP to reach compromises, and how the Women’s Coalition brought women from all parties together. 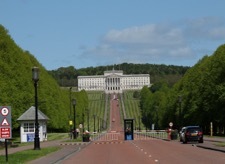 She and others made it very clear to us that the coalition power-sharing principles of the peace agreement (which we learned goes by both names of the Good Friday Agreement and the Belfast Agreement) had been useful but now are responsible for the stalemate in politics resulting in the suspension of the Assembly since January 2017. The NI Policing Board in Belfast is the civilian organisation that holds the police-force to account. It normally includes elected politicians, but not in the last 16 months due to the Assembly’s suspension. Police reform, following the Patten Report, includes positive discrimination in the recruitment of those ‘perceived to be’ Catholics (even if they are ‘Catholic atheists’) up to 50%, and currently at 31%. Overall it is officially regarded as a success, with very high monitoring by global standards. Investigations into historic cases of deaths involving the police are increasing in number. There are daily attacks on the police and weekly bomb threats. Suicide rates are one of the highest in the world and higher than the total killed 1969-97. We heard about ’punishment attacks’ from several hosts. These are committed by paramilitary groups, from both communities, against ‘anti-social elements’, allegedly with community approval. In Derry/Londonderry at a conference on ‘Alternative Punishment’, a speaker from a pensioners’ residents’ organisation gave a moving account about children and young people partying in her neighbourhood streets and gardens late into the night. She had talked with them, rescued some from enforced drug-taking and had returned naked, abandoned victims of sexual assault to their parents’ homes. She argued against a common view in her community that they should be subject to violent punishment, and that instead they needed help, ‘shooting them is not showing them respect’. We heard more about Inter-generational trauma and very high rates of suicide amongst young people. Finally we were honoured not only to hear about the different activities of a community organisation called The Junction in Derry/Londonderry, but also to meet and hear the personal life histories of two former ex-combatants who had been recruited to paramilitaries (UDA/UFF and IRA) as teenagers. They were both impressive speakers who described how their lives had been changed by their experience of story-telling and performance with the organisation Theatre of Witness. As a result they had actually become friends, which was truly an inspiration. We left with new networks, new questions and lots of food for thought.